First, thanks for this cool website its nice to know about hidden gems in our backyard. 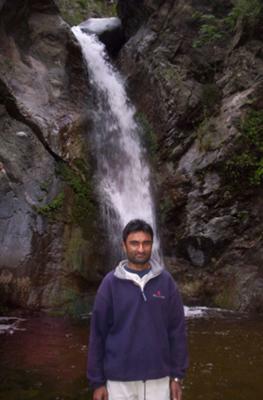 We went on May 24th, 2008 and had the pleasure of seeing a running stream all the way to Eaton Canyon Falls which were flowing well. Because of kids we chose to start at the Midwick drive trail which saved us about a mile of hike. From the trailhead you go down to the canyon bottom. Then after a short hike you find a suitable place to cross the creek bed to intersect the main trail on the east bank. Go left (north) and walk the path to the bridge. Before reaching the bridge, at a signed fork, veer left to stay on the canyon trail to pass under the bridge. You can also go right near the bridde and go down the steep slope if you want. We thought the guy, coming back from the falls with his family, was only joking but we later found out for real that the hike we had done that far was nothing and the real hike was about to begin. The sign near the bridge has said just a half more mile but that half mile had the route cross the creek about 9 times, tied together by short stretches of rustic trail. Reaching the falls was a delight. We felt that the hike was well worth it. I tried to wade through the water and get under the falls but had to stop once my rolled up pants started getting wet. Having no spare clothes I had to resist the temptation of a shower under the falls and come back. There were a couple of young teenagers who tried the same with their dad but just stopped short when they got all their clothes wet. I hope you guys have as much fun as we did hiking this trail and seeing the falls. P.S. Don’t forget to pack extra pair of socks because chances are very high you will get wet crossing the creek. You may also want to bring an extra pair of clothes if you can’t resist the temptation of a shower under the falls. Bring a camera and picnic food to further enhance your hiking experience.